This work by David Jordan is licensed under a Creative Commons Attribution-ShareAlike 4.0 International License. I recently came across a great tutorial by John Nelson in which he demonstrated how to create map of Switzerland in the style of Edward Imhof, the famed Swiss cartographer renowned for his hand painted maps of Switzerland and other mountainous regions of the world. John’s map used traditional hillshading, multidirectional hillshading and crucially, a translucent topographic layer that created a mist like appearance he likened to the sfumato technique used by painters since the Renascence. I followed John’s tutorial in QGIS 3.2 and I was quite pleased with the initial result below. However, the process creating it is a bit too complicated for a tutorial so I set about simplifying the process and rather than imitating Imhof’s distinct style, my goal this time is realism. The heart of the effect involves the very clever idea of using the topographic layer as a subtle opacity mask to simulate mist, fog and atmospheric haze. 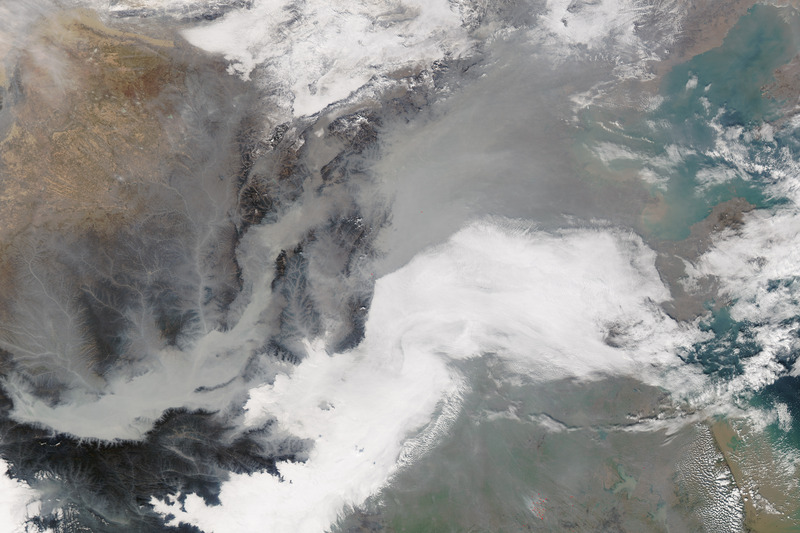 Have a look at the image below taken on March 17th, 2005 by NASA’s Terra satellite. This is the industrialised Po valley of northern Italy, surrounded by the Alps and Apennine Mountains that rise above the valley’s hazy pollution. The haze adds a sense of depth to the surrounding hills and mountains. 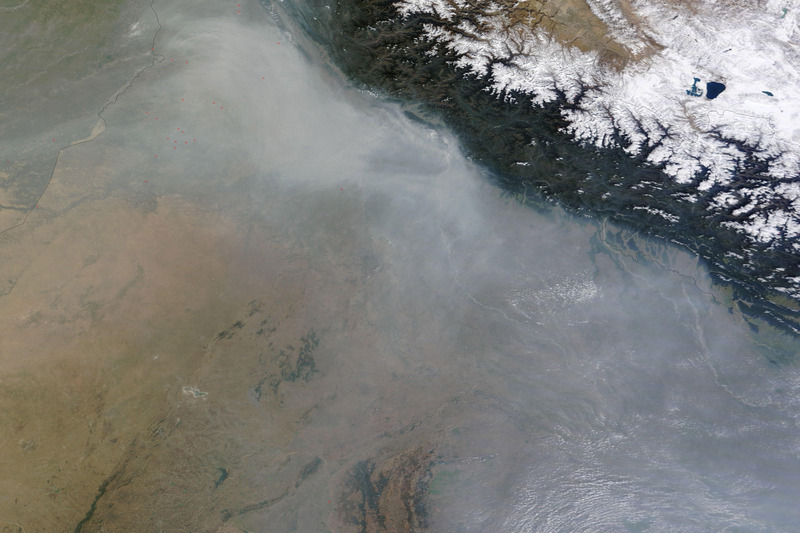 It’s not uncommon to see fog and pollution in satellite imagery that gives way to the clear air in high mountains e.g. northern India and Nepal, China, Pakistan and India. 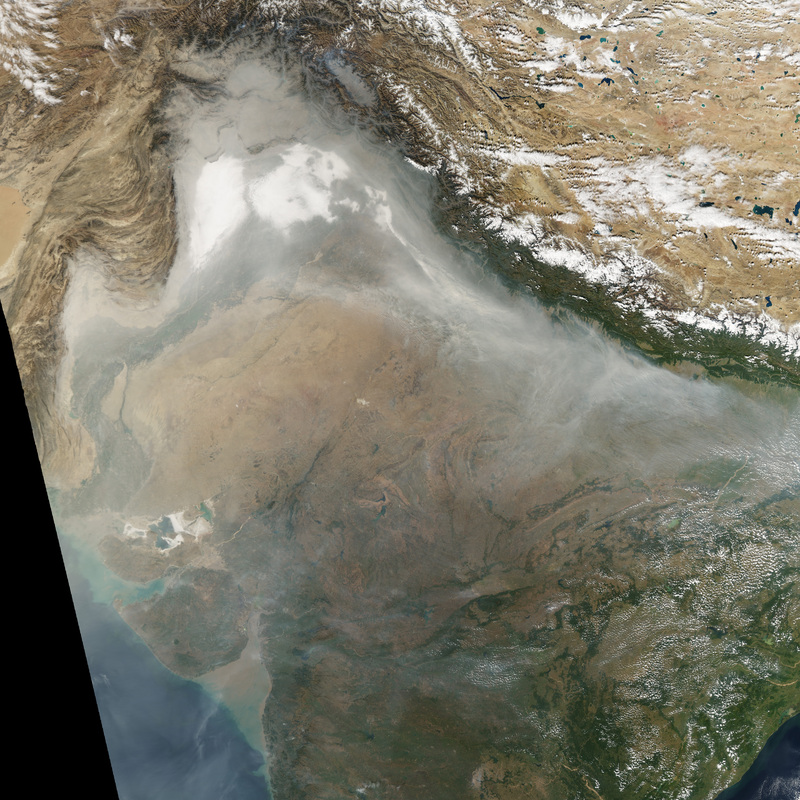 Creating a similar mist effect in QGIS is actually quite simple. First download topography for the Alps and Po region (a 68.55 Mb GeoTiff file derived from freely available EU-DEM data I resampled from 25 to 100m resolution). Next, make sure you have the plugin QuickMapServics (QMS) installed (menu Plugins – Manage and Install Plugins). This great plugin provides access to over 1000 basemaps. Load the GeoTiff file into QGIS (Raster – Load) and rename the layer Hillshade. Right click the layer to open the Layer Properties window. In the Symbology panel, next to Render Type, choose Hillshade. Change the altitude to 35 degrees, Azimuth to 300 degrees and Z Factor of 1.5 (illuminating the landscape from the top left). Finally, change the Blending mode to Multiply. Click OK to close the dialogue. To add the basemap layer, Esri World Imagery (Clarity), type “ESRI clarity” in the QMS search bar to find and add the basemap; Go to View – Panels and activate the QMS search bar if it isn’t initially visible. Make sure it’s the bottommost layer. Oh, that’s a bit disappointing, we only increased the relief little a bit. It’s missing the vitally important mist layer. To create mist, right click the Hillshade layer and choose Duplicate. Rename the new layer Mist and make sure it’s above the Hillshade layer. Now open the Layer Properties window of the layer, we’re going edit it’s attributes to make it look like mist. Close the Color Ramp dialogue. In the Layer Properties window, and this is very important, change the Blending mode to Lighten. Click OK to close the Layer Properties window. The mist effect looks great. It certainly adds a lot of realism to the topographic map, it now looks quite like NASA’s images. This is just a quick and basic map so there’s lots of scope to improve the effect. Play around with the colour of the mist layer and its opacity, or even brighten the Hillshade layer underneath. See what effects these changes have. Here’s another example below. In this example I duplicated the hillshade layer and set the second hillshade layer to Multidirectional Hillshading (yes, QGIS 3.2 has Multidirectional Hillshading). I then adjusted the transparency of both hillshade layers so they blended together nicely. I then replaced the basemap with another duplicated topography layer that I coloured using the gradient sd-a (by Jim Mossman, 2005) using the cpt-city plugin. And lastly, I doubled the opacity of the mist layer turning it into a milky fog. I think it looks great! What next? Well, there’s lots of possibilities. Perhaps download Martian topography and add mist to the bottom of Valles Marineris? Tzvetkov, J., 2018. Relief visualization techniques using free and open source GIS tools. Polish Cartographical Review, 50(2), pp.61-71. Posted in QGIS, Tutorial, Uncategorized. You may have seen my earlier tutorial where I described how to make nice looking hillshaded maps in QGIS using SRTM elevation data. Well, we don’t have to stop with just one hillshade layer on a map, it is possible to overlay multiple hillshades; a procedure that can increase the visual quality and detail. The following image is the hillshade we made before. Once you re-create a hillshade, following the previous tutorial, you can head to the next step (note that brightness and contrast settings may be different due to changes in how QGIS generates and displays hillshades). We can improve the SRTM hillshade further by adding ESRI’s World Hillshade layer, which uses multi-directional illumination (also called a Swiss Hillshade in tribute to the celebrated Swiss cartographer Eduard Imhof). In addition, World Hillshade has a much higher resolution than SRTM 30m data in some regions of the world, it is 2m for most of the England and Wales, 10m for most of the US, 5m for Spain and 3m for Holland etc. The only drawback is that the style of this layer is somewhat controversial, some love it, some hate it, it looks like it’s illuminated from above, but mixing it with the SRTM hillshade obviates some of it criticised flaws. Notice QGIS 2.18 no longer needs a plugin to add ESRI layers, it new has this functionality built in. Also, open the url in a browser such as Firefox, it brings up a webpage that describes the layer. We also see links to other other layers. Yes, they can all be added to QGIS by simply taking the URL of the webpage that describe the layer and connecting to it via the ArcGIS MapServer Layer connector. Name the layer World Hillshade and click Connect, then click and highlight the layer it connects to. Finally, click the Add button to add the layer to the canvas. Next, we need to adjust the properties of the World Hillshade layer to properly overlay it above the SRTM hillshade layer. Make sure the World hillshade layer is the topmost layer. In the Layers Panel, right click Layer properties and in the window that opens up, click Style (if not visible). Next, change the Layer Blending mode (under color rendering) to Overlay. Adjust the layer’s brightness to around -20 and leave contrast at 0. 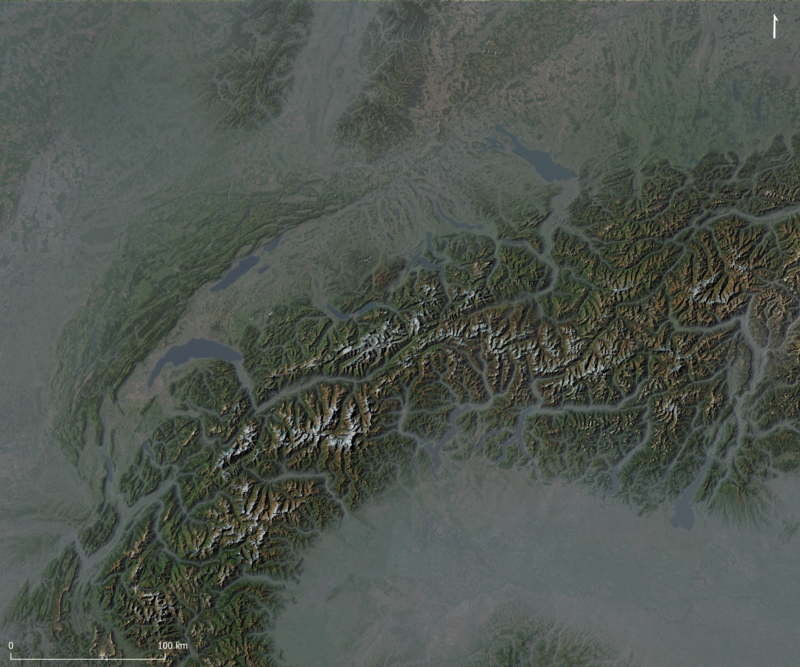 If you find the scene is still too dark, brighten the SRTM Hillshade by increasing the layer’s brightness. You may also have to change (lower) the Min value of the Min – Max value boxes. 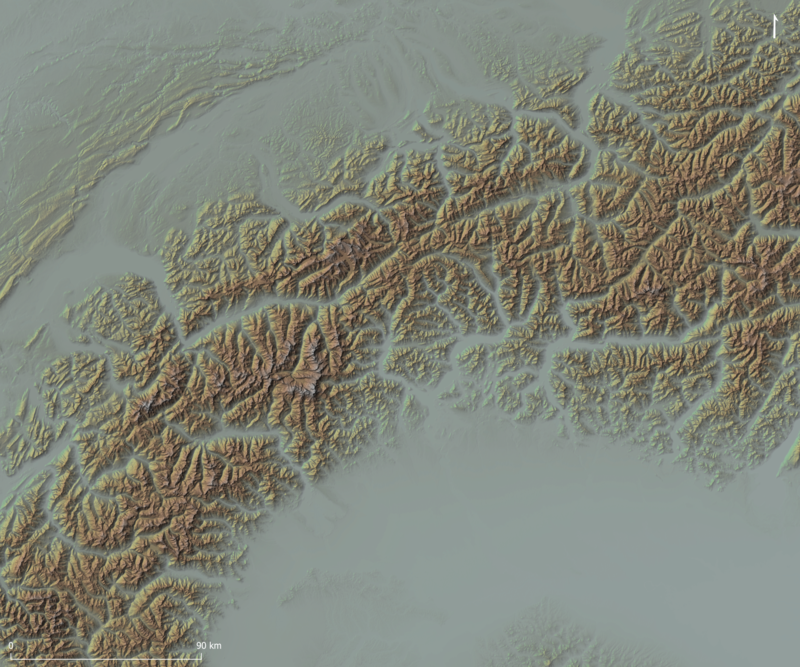 Leave the contrast at 0 for the SRTM hillshade. Also, don’t brighten it too much as it might become washed out, loose detail, especially in bright areas. Play around the controls, settings may vary depending on the SRTM data you download and the version of QGIS you use. We can see the World Hillshade + SRTM Hillshade layer shows much finer detail. We see a parallel array of roughly north-south orientated lines, these are fractures and faults that cut the Slieve Gullion Complex that were perhaps enhanced by glacial erosion. Also, look carefully, there seems to be some roads meandering across the landscape (hint, bottom of the map and right of the scale bar). You should get even better results with higher resolution World Hillshade data. We also notice that bending SRTM derived hillshade with World Hillshade adds a naturalistic illumination not apparent in multi-directional hillshading. So we have the best of both worlds, a high resolution hillshade and realistic looking illumination. Hope you found this tutorial helpful. Baxter, S., 2008. A Geological Field Guide to Cooley Gullion, Mourne & Slieve Croob [pdf]. Geological Survey of Ireland, Dublin. p. 43-53. Imhof, E. 1982. Cartographic Relief Presentation. Walter de Gruyter GmbH & Co KG. Geologists display the dip and strike of rock layers on geological maps using a dip and strike symbol, where dip in degrees indicates the maximum angle a rock layer descends relative to the horizontal. However, it is not directly possible in QGIS 2.18, using basic label settings, to place and orient a dip label next to a dip and strike symbol. You can add Angle and Distance values to these columns manually or use the Field Calculator (see below) to add values if you have lots of points. Also, I chose Map Units (not millimeters) for Symbol Size, Font Size and Distance for my map, as I prefered to keep symbol size, font size and position of labels fixed when zooming in and out. The following geological map of the Old Head of Kinsale in southern Ireland shows the results of the above procedure. We see that the dip labels rotate and currently follow the orientation of the dip and strike symbols (note that the points are at the intersection of the T symbol). You may have several different symbols, of various sizes, each requiring an appropriate label distance expressed in the Attribute Table. It took me a few tries before I found the right distances for my geological symbols, from 90 to 230 meters distance depending on the symbol size and type. Lastly, the expressions “Angle” – 90 and (“Angle” – 90) * -1 were necessary in my case because I needed to place my labels next to the dip and strike symbol’s barb. You may need to use a different expression e.g. “Angle” and (“Angle”) * -1, or a value other than 90° depending on the symbol used and the prefered label placement location. Some trial and error is may be required to find the correct label position. The task of projecting, or unfolding the spherical Earth onto a flat map, is an age old problem in cartography. Projection almost always introduces distortion, most projections cannot preserve angles, areas and distances at the same time, they may be conformal (angle-preserving), equal-area (area-preserving) or equidistant (distance preserving) but not all at once. 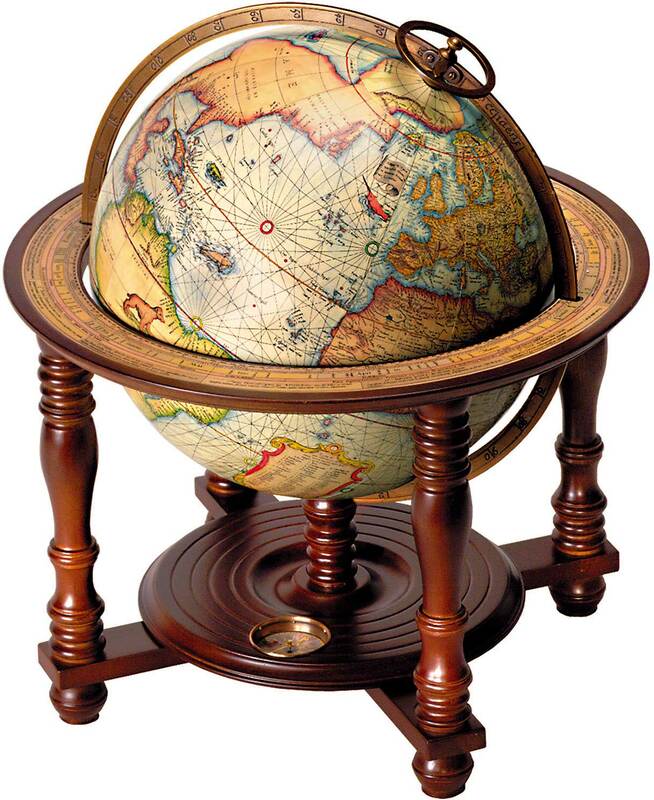 The only exception is a Globe, which preserves angles, areas and distances perfectly. Thus a projection is a compromise. The choice of projection depends on a map’s use, scale and audience. Conformal projections, for example, are preferred for nautical charts or small scale maps because they locally preserve angles necessary for navigation and survey drawings. Equal-area projections are best suited for maps of broad continental region as they preserve the relative sizes of countries, seas and oceans and allow comparison between regions. 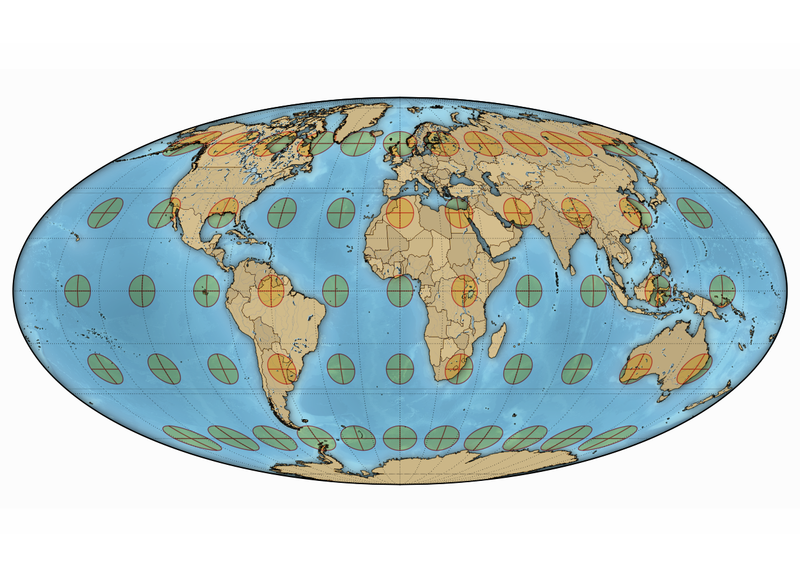 Finally, there are hybrid projections that minimise the distortion by merging conformal and equal-area projections, these can be used to create visually pleasing maps of the entire Earth (for a guide to selecting a map projection see Fig. 9 in Jenny (2011), link below). But how does one measure the degree and type of distortion in a map projection? One elegant method was developed in the 1880s century by the French cartographer Monsieur Nicolas Auguste Tissot, the Tissot’s Indicatrix (or Tissot’s Ellipse). This mathematical contrivance consists of a grid of infinitely small circles that measures the degree and type of distortion caused by projection. While Monsieur Tissot’s approach is mathematical, involving infinity small circles, his technique can be approximated overlaying a regular grid of large circles and crosses to a map. After adding the Indicatrix Mapper plugin to QGIS (menu Plugins – Manage and Install Plugins) first add a basemap using the OpenLayers plugin e.g. Bing Aerial layer, then click the Indicatrix Mapper icon and run the plugin using default settings. You can then select different projections (lower right in world icon QGIS) to see the effects of various protections on the Tissot Indicatrix. If the circles appear as squares after selecting a different projection, right click the Circles layer in the layers panel, then select the Rendering tab and deselect the Simplify geometry check box. Also, turn off the basemap layer when using different projections, unfortunately the OpenLayers plugin only supports Google Mercator projection (EPSG 3857). To create the basemap below, that can be displayed using different projections, I styled vector data downloaded from Natural Earth and OpenStreetMap. Mercator Projection – the area of the circles and size of the crosses increase towards the poles but their shape remains the same. Mollweide Projection – the area of the circles remain the same but their shapes are distorted, the crosses do not always intersect at 90 degrees. Robinson Projection – both the area of the circles and intersection angle of the crosses circles vary. It is important to note that a Tissot’s Indicatrix generated in QGIS is an approximation of mathematical ideal, we are not no longer dealing with infinity small circles. 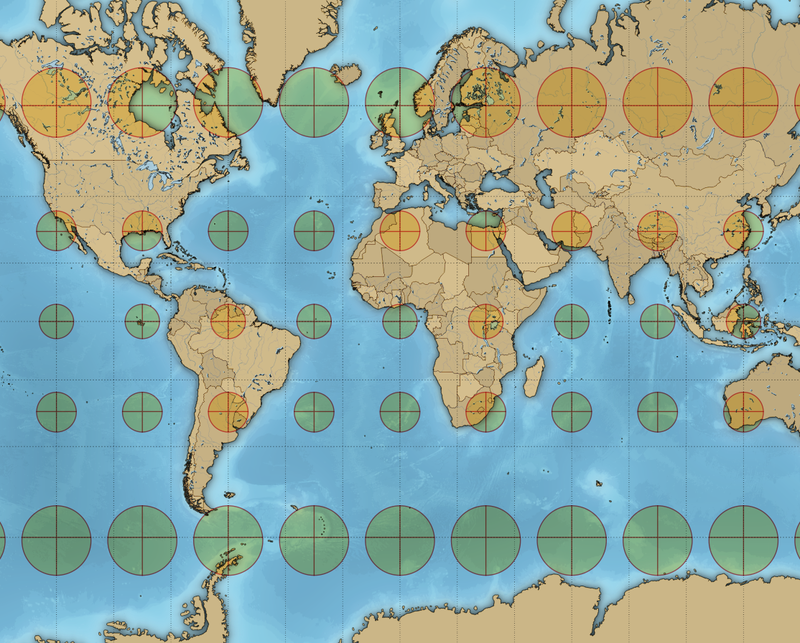 As a result, here will be some minor distortion visible towards the edge of a map independent of the projection used; notice that the circles in the Mercator projection nearest the poles are not quite symmetrical or the circles at the edge of the Mollweide projection do not appear to preserve area as they should. This anomalous distortion can be minimised by reducing the size and spacing of the circles and crosses created by the Indicatrix Mapper plugin. However, despite these limitations a Tissot’s Indicatrix elegantly reveals the distortion present. This is something to important to understand when when choosing a map projection. Jenny, B., 2012. 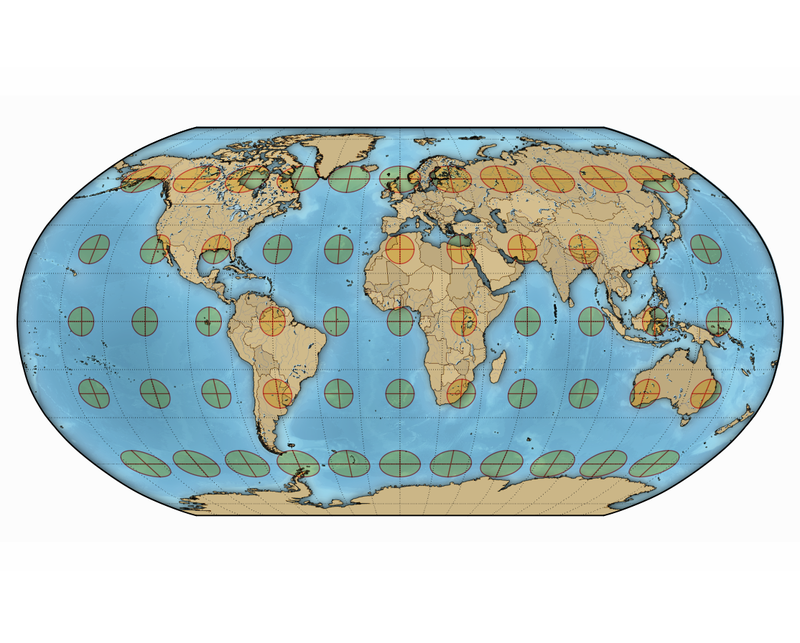 Adaptive composite map projections [PDF]. Visualization and Computer Graphics, IEEE Transactions on, 18, 2575–2582. Tissot, M.A., 1881. Mémoire sur la représentation des surfaces et les projections des cartes géographiques. Gauthier-Villars.